With devices like the HTC Rezound (Vigor) and Galaxy Nexus headed to Verizon stores within the next few weeks, we are starting to see prices of their predecessors get slashed. The DROID Charge dropped to $199 on Friday and now the Thunderbolt is joining the party. If for some reason you feel like you can’t wait for the Rezound, then by all means jump on Big Red’s first 4G LTE device that has quite the developer following. For $49 (current customers), you can get the device and a free extended battery (a $49.99 value in its own right) if you purchase online. 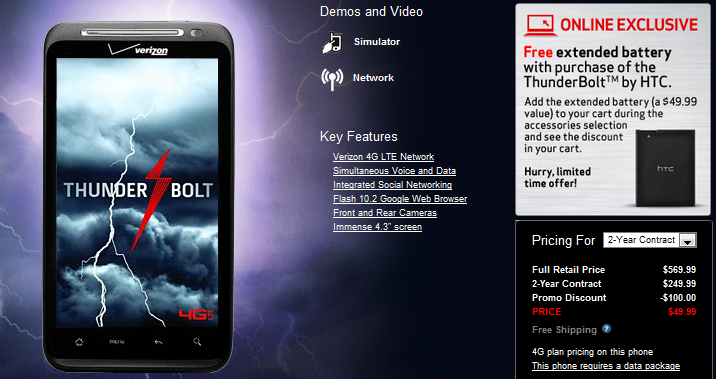 If you are not a current customer, the price is appearing as $149 with a free battery tossed. This is easily one of the bigger price drops we have seen in some time. *Note – In order to see it at $49, you have to be logged into your account. *Note 2 – Many of you are only seeing it as $149. Could be an error, will keep an eye on it. Update: Looks like the $49 price was just an error. Silly Verizon. Cheers DL App tipster and Tim!